"I know what I like, I just don't know how to pull it together"
I think the stumbling block is mostly a combination of lack of confidence combined with a fear of making the wrong decision. It's easy to pin hundreds of images on Pinterest and Houzz but when it comes to actually moving ahead with selections, a lot of people really struggle with the decision-making process. Sound familiar? This sounds simple but with the endless online eye-candy assaulting us daily, the options are seemingly endless. You have no idea the mishmash of contradictory styles most clients share with me on their inspiration boards. They will say things like, "I love this classic, buttoned headboard but I also LOVE this hot pink bird of paradise wallpaper"! There is no consistency. Choose a small handful of images rather than constantly scouring the internet for ever-better inspiration. Find your style and stick to it. If you are starting from scratch then it's crucial to get the key elements right before you start getting carried away with what scatter cushions are going on the sofa - flooring, paint and hard finishes will set the tone and determine the tonal palette of your future selections. Always start with flooring, then choose other hard finishes like cabinetry colours before finally selecting the paint - there are hundreds of white paints to choose from but I guarantee there will only be one or two floor tiles that you fall in love with. When putting together a decorating scheme I always begin with the largest items first and work backwards - sofa, dining table, headboard etc. The same principal as above works here. It is much harder to find the perfect sofa in the perfect fabric than it is to find cushions or accessories Keep focused on selecting each piece, trying not to get distracted by pretty coffee table arrangements along the way. My husband's favourite expression is 'don't let the tail wag the dog'! Once you've nailed the big furniture pieces you can then start layering the scheme with colour and texture through accessories. By far the easiest way to do this is to select your artwork first. This will help guide your colour selections for cushions, vases, rugs and other decorative items. Never underestimate the power of a beautiful artwork and how it can play a crucial role in connecting all the pieces of the jigsaw puzzle. Stunning interiors are never created by standing on the sensible, conservative side of the fence. Even the most classic, impeccably designed interior will have an element of surprise that elevates it from the everyday, run-of-the-mill home. A lot of clients I meet will have seen something they absolutely love like a wallpaper or a pendant light but they are terrified of using it for fear of not being able to carry it off. If you have courage in your convictions, if you are passionate about living in a house that reflects you and only you, then be brave and do that one bold, slightly crazy thing you've been dreaming of - it will pay off I assure you. It has been so chilly here lately. The garden lies dormant and all the outside colours are quiet and muted, waiting for the loud cacophony of spring. I love the monochrome neutral palette of browns and greys, always finding inspiration for interior schemes in the subtlety of nature. One of the most common questions I'm asked as an interior designer is "which white paint should I use"? It sounds simple... how hard can it be? You select white, white or white right? Wrong! Choosing the correct shade for your walls is probably the single most important decorating decision you will make. Not only will it set the tone for the entire scheme, but will effect every other component of the interior (and your mood!). There are hundreds of different shades of white on the market so you need to narrow the field. Broadly speaking, whites fall into three main categories; pure whites, warm whites and cool whites. When you look at a colour chart you will likely be instinctively drawn to either cool or warm tones. On the whole, warmer tones work best in more traditional interiors while cooler tones suit a more modern space. The pure whites are great for trim (architraves, skirting, doors etc) and will make the wall colour pop. A word of warning: warm tones with a strong yellow base will look a bit dated and throw cream when in direct sunlight while cool shades with a strong grey base can end up looking clinical and cold. Once you have figured out which tonal family suits you prefer, start picking out particular shades you like. I always recommend that clients paint large pieces of cardboard (1m x 1m) with a test pot rather than painting directly onto the wall - that way you can easily pick them up and carry them to different parts of the house to test different lighting situations (make sure you paint two or three coats and also paint a strip of the trim colour the same width as your skirting). Testing the colours in your home is a critical step as different lighting conditions will have a tremendous impact upon the look of the paint. What looks great in once house will not necessarily work in another. If you are choosing colours for a new home not yet built, order large brush-out samples from the paint manufacturer (large A4 colour chips) and look at them in similar lighting conditions. It is always amazing how different a shade looks in a big piece! Many clients come to me completely overwhelmed by the prospect of making decisions on the colour of paint and hard finishes. The best approach I have come up with over the years is to select everything at once. Choose carpet, tiles, timber colours, laminates and other key items at the same time as you choose the paint. Never choose anything independently. That way you can change things as required once you see them all laid out together - believe me it's far easier to alter a paint colour (of which there are endless options) rather than change a carpet colour you love! 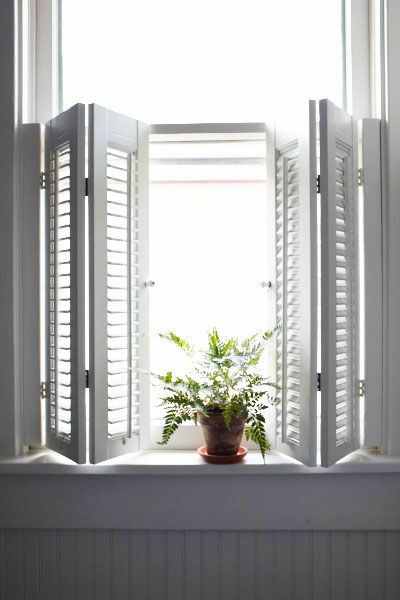 I love the overall look of Plantation Shutters but find that they can sometimes obstruct a beautiful view and natural light. One of my favourite tricks is to use half height shutters, particularly in rooms where full light block-out is not a priority. The half height shutter still provides privacy but leaves the top section of the window free of window covering, allowing light to pour in at all times of the day. It is a great solution for bathrooms, window seats, dining rooms and living areas and always makes a room feel spacious and more connected to the outdoors. A half height plantation shutter is ideal above a window seat where you still want to allow plenty of natural light into the room. 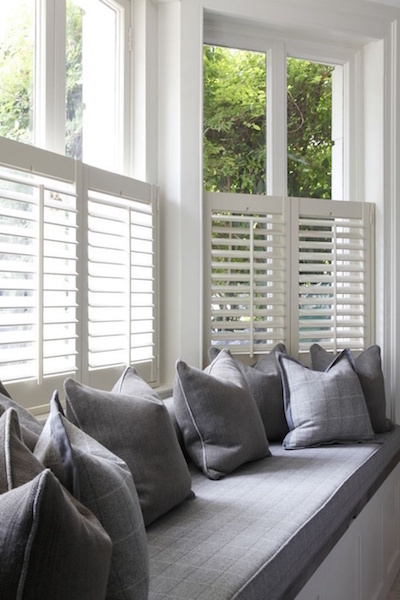 Half height plantation shutters allow the best of both worlds in terms of giving a classic look, while still allowing precious natural light to flood in. I am heavily influenced by Swedish style, loving their impeccable take on interiors (apparently I have more than a little Northern European in me which might explain it!). Recently I came across the work of Swedish Stylist Hans Blomquist and I was overcome by his talent and the beauty of the spaces he creates. He plays with both light and dark interiors, often contrasting moody walls with bright whites or vice versa. His sense of proportion is spot on, his compositions faultless. His images have depth and personality that literally burst off the page. There is much to learn from such a master of the trade. We recently designed some beautiful white painted built-in cabinetry for some clients in Mosman. The house is a handsome Federation home with very traditional detailing so the brief was to maximise storage while maintaining the architectural integrity of the space. We decided to take advantage of a stunning bay window to create a window seat complete with storage drawers below. We added a cupboard and bookshelves beside the fireplace and a desk with overhead cabinetry capable of accommodating two work spaces. The result is a beautiful, library-like space with ample storage for a growing family. I'm a big fan of using pin boards in kids rooms and work spaces but it can be tricky to find a really contemporary solution that looks stylish in its own right before being covered with bits and bobs. I LOVE the pin boards created by Al & Em. Their range comes in 8 colours (my favourite is grey) and can be custom made to size. They also have a cute collection of rabbits and dinasours and fairies, just perfect for adding some whimsy to children's spaces. A beautiful rug is like artwork for the floor but using colourful, patterned rugs can be tricky as they can easily overwhelm a space and dictate everything else that happens in the room, limiting other pattern choice and fighting for attention. A great way around this is to choose a colour block rug that still packs a punch in terms of wow factor but still leaves you plenty of scope to play with other colour and pattern combinations. I'm loving the new bespoke Marle Collection from Armadillo & Co which has a huge range of muted brights that are easy to work with. I really loved the fresh simplicity of this coastal bedroom scheme I recently put together for some clients. The combination of soft blues and brushed silver really lifted the space, turning a very nondescript room into a beautiful, tranquil oasis. My favourite piece is the silver leaf chest from Bloomingdales. We were fortunate enough to be engaged to prepare a paint colour scheme for a beautiful old home on Sydney's North Shore. The brief was to update the existing dated caramel and black colour scheme while still keeping an elegant, classic feel. We chose a combination Dulux Pipe Clay, Mt Eden and Natural White, repainting the windows and detailing in white to make the home less formidable. The first stage of our Mosman job has been installed and is looking so beautiful! The stunning cross back chairs from Casa Mia are upholstered in Sanderson Taormina Velvet while the piped sofa is in Westbury Glazed Linen. How great is this concept from Raw Mix? Delicious Bliss Balls in a jar - all you need to do is add coconut oil and hey presto! We had so much fun making them this afternoon... just perfect for little helping hands. Welcome to our new web space. We'll be updating and sharing our work here on the blog, so stay tuned.